There are certain health developments that everybody loves: the ones that involve eating snacks. And a new study is showing even more benefits of eating a popular tasty treat. The health benefits of dark chocolate are certainly not underreported. The association of polyphenol and flavonoid antioxidants and their abilities to combat inflammation and improve mood are reasons that make this decadent treat somewhat of a health food. But if you’re a chocolate junkie, make sure you reach for the dark stuff—at least 85% cocoa—and leave the milk chocolate on the shelf. Milk chocolate offers no health benefits and is more fattening and sugary than the purer cocoa chocolate available. A small Italian study recently published in the Journal of the American Heart Association shows eating dark chocolate helped improve blood flow, possibly by increasing levels of nitrous oxide in the blood. Nitrous oxide relaxes blood vessels, which allows them to expand so blood passes through your body more easily. The tests were done in a small group of 40 individuals who suffered from peripheral artery disease (PAD). Symptoms of PAD include cramping and difficulty walking and exercising. With PAD, blood is cut off in the arteries that can result in poor limb function. PAD affects about 20% of Western adults over 70. For the study, 20 of the participants were given 40 g (1.5 ounces) of 85% cocoa dark chocolate and the other 20 were given 40 g of milk chocolate with less than 30% cocoa. Both groups then walked on a treadmill. The ones who had eaten the dark chocolate were able to make it farther. It was only by about 40 steps, but hey, a win’s a win, right? It’s believed that the dark chocolate boosted participants’ nitrous oxide and allowed that group to go a little farther. At the end of the day, dark chocolate might help improve your blood flow at marginal levels, but I wouldn’t go stuffing your face. 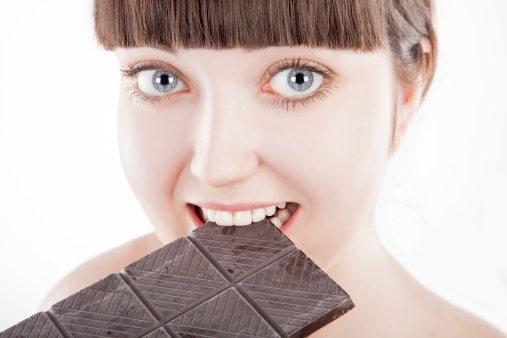 You’re more likely to gain weight by eating chocolate. There are other ways to improve circulation and nitrous oxide levels that are both more effective and perhaps healthier. Watermelon, salmon, avocado, garlic, and oranges can all improve blood flow, and activities like yoga have worked far better for people with PAD than chocolate. In any event, if you love chocolate as much as I do, these benefits are just a little bit of icing on the cake. But still, even if there are some benefits to eating it, you still need to acknowledge that chocolate is basically junk food and should be consumed sparingly. A couple of squares from a nice dark chocolate bar is a perfect little after-dinner or mid-afternoon snack. Any more than that and the calories can start to run up really fast. So make it a special treat you can feel good about! Loffredo, L., “Dark Chocolate Acutely Improves Walking Autonomy in Patients with Peripheral Artery Disease,” Journal of the American Heart Association, July 2, 2014; http://jaha.ahajournals.org/content/3/4/e001072.full. Seaman, A., “Dark Chocolate May Ease Walking for Patients with Artery Disease,” Reuters web site, July 3, 2014; http://in.reuters.com/article/2014/07/02/us-chocolate-artery-disease-idINKBN0F72DK20140702?linkId=8739964.